Hi everyone! 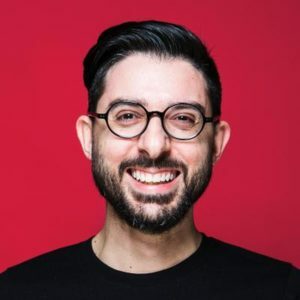 Today’s interview is with David Darmanin, CEO of Hotjar, a powerful tool that allows you to see how visitors are really using your website, collect user feedback, and turn more visitors into customers. Today we’re talking about this great all-in-one analytics tool and how they’ve grown rapidly via both paid and unpaid advertising, how they’ve increased retention over time by building new features, and why finding the right people for your team early on is so important. David always had a passion for creating visual stuff which, back in the day, was flyers (and later web design), and he was determined to understand what made a design good (or bad). Eventually he became a consultant who worked for big clients, but he wasn’t happy using the tools that were available, wasn’t happy with how they worked or how they were priced. So he reached out to some of the talented people he had worked with before and they got together and basically changed the way this industry works—which is the industry of how a website is being used and what your users think about it. While Google Analytics shows you where your visitors are going on your site, Hotjar actually shows you what they’re doing and what they think. It shows heat maps and aggregate visualization—like where your visitors are clicking, how they’re moving their mouse, how much they’re scrolling—and you can even record and replay a whole session. They’ve even made it possible to get feedback, so you can ask questions, do surveys, or recruit people to join you on a user test. In summary, Hotjar is an all-in-one analytics and feedback tool. Hotjar is a free tool, so even though they have customers on higher-tier plans, their vision is to change the way the web is built and improved. As such, one big metric for them is how many people are actually using the tool. They have 80,000 subscribed users and out of that they have about 6,000 paid organizations—and this number is growing quite quickly. This is not something they optimize against, but obviously their customers are important, so they make sure that their users are getting the most value out of Hotjar. After all, having satisfied customers is the best way to grow. David says they were lucky that after a 7-month initial beta program, within 4-6 weeks they were already covering all their operation costs because they had so many users who were willing to pay to continue using it, and within 6 months they hit $1M in ARR (Annual Run Rates). So the real core of why they managed to succeed, after David had already failed at two previous projects, is that they focused on solving a problem that many people have. They approached the business in a very lean way; by kicking off with a 7-month beta program, it was very easy to grow, spread the word, get people using it, get feedback, and make sure they built a kickass product. If you’re building a product or running a business, you can’t force people to spread the word, so the key is to build a product that generates that type of enthusiasm. Then you can do a lot to incentivize it and make it easy for fans to spread the word for you. During their beta run, they gamified the idea of getting access to Hotjar by having a queue system where the more you share the higher up you go and the earlier you get access. David and the other founders put a lot of effort into speaking to sites that cover beta programs, sent out email blasts to their communities, got really good coverage twice on Product Hunt, and had a lot of bloggers talking about Hotjar. And then, to add fuel to the fire, they also did some paid stuff, like Facebook targeting to typical users. So even though some of this was paid, it was not advertising so much as facilitating and accelerating the spreading of the news. With tools like Crazy Egg, many people find that once they’ve got the heat map they don’t really need to keep using, so they get what they want, cancel, and possibly come back later. This also happens with Hotjar, so they’ve focused on building a product where you can upgrade or downgrade whenever you want, since there’s no yearly requirement. Flexibility is really important for long-term relationships with their customers. From a business point of view, of course, there are gains to keeping customers as long as possible, so to that end they’ve got some exciting new updates in the pipeline (which they’ve developed as a result of feedback from their users), such as new functionality for day-to-day use, like event tracking or continuous inbound feedback. One of the biggest challenges they faced was finding the right people early on, which can be very difficult for a small startup. It’s very easy and tempting, especially when you’re building something that is gaining visibility and momentum, to quickly bring on board those people who reach out to you because it seems like a good opportunity. But it’s really important to define a long-term vision and a roadmap and then plot out who you need in terms of roles and responsibilities. That way you avoid just going with the first choice that comes along. And if you don’t find the right person right away, you must patiently wait until you do. People will advise you to employ your friends, which can be good if you’ve already worked with them in the past, but only if they fit into the role you’ve defined. Don’t take shortcuts because it can be much more painful later on. So just as you build demand for your product, you have to be thinking about how to build demand so that the right people will be attracted to working for you. Because Hotjar is a remote business, it can be tricky to bring someone on who doesn’t have remote experience. So they advertise on sites like We Work Remotely or Stack Overflow, as well as leveraging their 80,000-user base by asking them if they know of anyone relevant when a new position opens up. The most indispensable tools they use at Hotjar to work remotely are HipChat (Slack is a great alternative), where you can create separate channels for different topics or quickly communicate directly with individual team members, and Hangouts to launch calls and use the calendar. And they run the whole company on Google Apps. David finds that the key around culture in a remote company is to have the right tools in order to leverage very transparent communication, which doesn’t need to be over-complicated, but you do need a good structure. It’s important to focus on documentation and process because when you’re not there personally, the processes become much more important. Friday everyone presents everything that’s been done. Every day they have a quick “scrum” call. Plus monthly company meetings. They plan to meet up 1-2 times a year in Multa (an island in the Mediterranean) and so far they’ve had one meet up which was fun,and promoted team building, socializing, and brainstorming. He would definitely tell his younger self to focus much more on the user than on the business. At 25 he was already building and growing businesses, and he wishes that he knew back then what he knows now, which is: if you center your strategy around value for the user—what they think and feel, and what their problems and needs are—you’ll be much more successful at a faster rate. Gets up very early to play with his kids. Then uses the silent time in the early morning hours to get a lot of content writing done. Later in the morning he has calls with the team or customers or doing demos. Early afternoon is for 15-minute “scrum” calls with the team to understand what’s going on. The afternoon themes vary—could be about growth, culture, etc. As for email—he minimizes time spent on email (usually first thing in the morning and then a lot in the evening) as it can highjack the whole day!